TEGUCIGALPA, Jul 9 2014 (IPS) - The new official secrets law in Honduras clamps down on freedom of expression, strengthens corruption and enables public information on defence and security affairs to be kept secret for up to 25 years, according to a confidential report seen by IPS. The Law on Classification of Public Documents related to Security and National Defence, better known as the official secrets law, was approved on the eve of the conclusion of the last parliamentary term, on Jan. 24. In a marathon two-day session, Congress approved a hundred decrees and laws to smooth the path of the new government of President Juan Orlando Hernández, who took office Jan. 27 and belongs to the right-wing National Party, like his predecessor Porfirio Lobo. “This law lets the government behave like a cat that covers its own dirt,” shopkeeper Eduardo Tinoco told IPS wryly. He pays 20 dollars a week extortion money to one of the gangs that control El Sitio, a neighbourhood in the northeast of the capital. “I pay taxes here for everything, even to be allowed to live, and that secrecy law will only be used to cover up the diversion of funds used for security and other government business. There are no two ways about it,” said Tinoco, who owns a small grocery store. 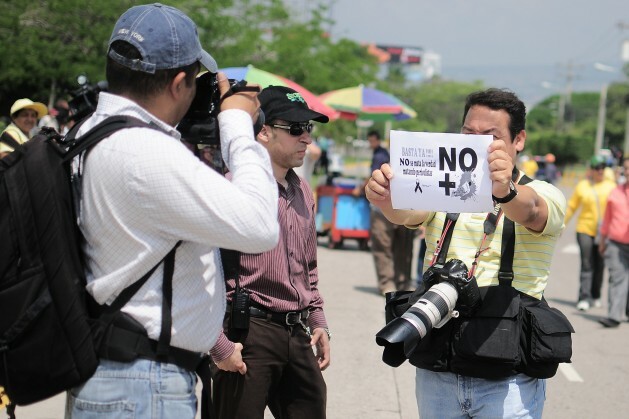 The law was blocked in October 2013 because of opposition from the Honduran Community Media Association (AMCH) and international groups, which regard it as a violation of the right to information and freedom of expression. But it was reconsidered in January. How this occurred is not really known, because there are no audio records in the parliament archives that indicate when the bill was reintroduced, legislature officials told IPS on condition of anonymity. A report by a team of experts for the Institute for Access to Public Information (IAIP) says that the official secrets law lacks a clear definition of “national security” and this ambiguity opens the way to discretionality, so that anything considered sensitive may be classified as secret. The IAIP is the autonomous state body responsible for ensuring transparency in Honduras, according to the Law on Transparency and Access to Public Information. IPS obtained the report, which is due to be made public in a few weeks. The law sets four classification levels: private, confidential, secret and ultra secret, with periods of secrecy of five, 10, 15 and 25 years respectively, which may be extended as determined by the National Security and Defence Council which is responsible for classifying and declassifying material. This Council is made up of the three branches of state, the Attorney General’s Office, the ministers of Defence and Security, the national Information and Intelligence Office and the chairman of the Joint Chiefs of Staff of the armed forces. Information classified as “private” is lower level information, documentation or strategic internal material within state bodies that could cause “undesired institutional effects” if they came to light. “Confidential” is the term attributed to intermediate level information, which could cause “imminent risk” or a direct threat to security, national defence or public order if it were made public, the law says. Finally, “ultra secret” is the highest level classification and is described as material which, if in the realm of public knowledge, would provoke “exceptionally serious” internal and external harm, threatening security, defence, sovereignty and territorial integrity, and the achievement of national goals. His main concern is related to the security tax that has been levied on businesses and individuals for the past two years, as a contribution to the fight against insecurity and violence. This law “will make it impossible to get factual information on how the millions of dollars the state collects are spent,” he said. The IAIP report highlights the same discretionalities, pointing out that any information about a public official being implicated in corruption can be classified as “ultra secret”. In this case it would be classified for 25 years, by which time the statute of limitations for prosecuting public servants for corruption would have expired, and no one would be held accountable, the report analysing the law says. Meanwhile, human rights expert Roberto Velásquez told IPS that the law directly targets journalism and freedom of expression, by putting a stranglehold on investigating or disseminating information. Also, any person having knowledge of classified information is obliged to “keep it secret” and report it to the nearest civil, police or military authority. The new law directly contradicts the Transparency Law, in force for the past five years, by removing the IAIP’s powers to classify information regarded as secret, and overriding guarantees for freedom of expression and investigative journalism. Doris Madrid, the head of IAIP, told IPS that it is hoping that the official secrets law will be reformed, on the grounds that it is unconstitutional and violates international treaties, but a proposal to revise or repeal it was turned down in Congress in March. IPS learned that Transparency International made the signing of an agreement with the government on Open Budgets conditional on a revision of the law. Honduras is regarded as one of the Latin American countries with the highest perception of corruption and insecurity. In April, the United Nations Office on Drugs and Crime (UNODC) indicated that this country of 8.4 million people has the highest murder rate in the world. The Observatory on Violence at the National Autonomous University of Honduras reported this rate as 79.7 homicides per 100,000 inhabitants. But now the authorities have refused to give any more figures on violent deaths to the Observatory, its members have complained.